English is definitely a heavily used language in the world (including the web, music, movies, books, etc), consequently, numerous users are trying to learn and/or improve their English skills, usually via printed books, online articles and/or specialized software, bundle of sources featuring explanations, use cases, translations, etc in a step-by-step approach. PYEnglish is a handy utility created with a different attitude in mind, forcing the user to write the correct sentence. 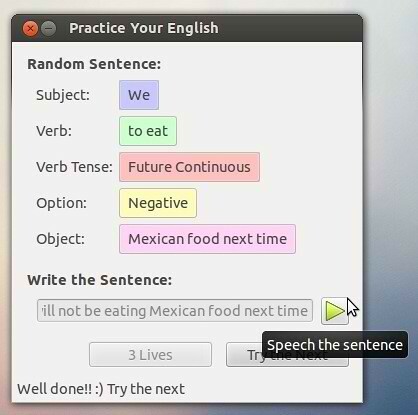 The app provides per-detail-colored items to be utilized (subject, verb, verb tense, object, basically all the components needed for a sentence) by the user with the main goal of combining them in a correct sentence by adjusting the provided items to conform to the specified parameters (like for instance, modifying the to work verb to Present Perfect). If the user's typed sentenced is exact, an OK icons appears, contrary there are available Try the Next (refreshing the displayed elements) and Lives (exposes the correct sentence). PYEnglish features, if the typed sentence is accurate, audio pronunciation via the Speech the sentence button. No Comment to " Improve your English in Ubuntu 12.04/Linux Mint 13 with PYEnglish "